The GoPro camera enables a new generation of family documentarians, extreme-sports aficionados, and ambitious filmmakers to cover winter sports and activities with relative ease and little worry about the equipment. Ice skating: Mount the camera to yourself, using one of the body mounts (headband, helmet, Chesty, and so on), and get a fresh view of a day at the rink. Sledding: Attach the GoPro to yourself or your sled to capture the sensation of flying down a snowy hill. Snowboarding: You wear your GoPro with the helmet mount or on your back with the Seeker backpack. It provides three mounting options while carrying your stuff at the same time. Skiing: Mount the camera on yourself or use the 3-way pole to produce your own exciting ski video. Other options include mounting your GoPro on the Seeker backpack or attaching it on your ski pole with the Pro Handlebar / Seatpost / Pole Mount. Snow tubing: The helmet or headband mounts work great for this purpose, letting you capture the rush of going down the mountain. Shoot the scenery, or turn the camera around to record your buddy’s expression. Put it on a RVC: Some radio-controlled vehicles are powerful enough to trudge through the snow. For the figure shown, one of the adhesive mounts was attached to the vehicle, then the camera was slid into the mount. For stabilized footage, use the Karma Grip gimbal to create amazing footage. 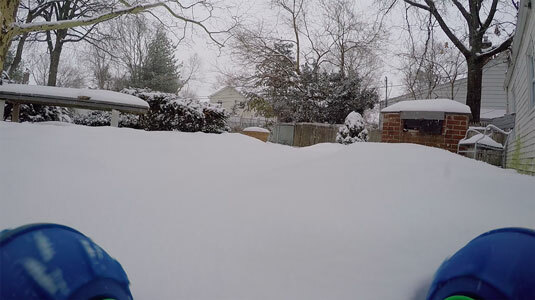 Snowman time-lapse: Mount the GoPro nearby and get to work on Frosty. You can mount the camera to a tree or use the tripod mount. Later, over hot chocolate, watch your hour-long effort in 45 seconds. You can also mount the GoPro on a warm day to capture the hours-long melting process in less than a minute. Use a portable power pack for longer durations. This snow scene was captured at ground level.